We’d love your help. Let us know what’s wrong with this preview of A Tangled Web by L.M. Montgomery. No amount of drama between the Dark and Penhallow families can prepare them for what follows when Aunt Becky bequeaths her prized heirloom jug - the owner to be revealed in one year's time. The intermarriages, and resulting fighting and feuding, that have occurred over the years grow more intense as Gay Penhallow's fiancé leaves her for the devious Nan Penhallow; Peter Pen No amount of drama between the Dark and Penhallow families can prepare them for what follows when Aunt Becky bequeaths her prized heirloom jug - the owner to be revealed in one year's time. The intermarriages, and resulting fighting and feuding, that have occurred over the years grow more intense as Gay Penhallow's fiancé leaves her for the devious Nan Penhallow; Peter Penhallow and Donna Dark find love after a lifelong hatred of each other; and Joscelyn and Hugh Dark, inexplicably separated on their wedding night, are reunited. To ask other readers questions about A Tangled Web, please sign up. "I am ready to die. I've felt almost everything in life there is to feel - ay, I've drained my cup. But I mean to die decently and in order. I'm going to have one last grand rally. The date will be announced in the paper. But if you want anything to eat you'll have to bring it with you. I'm not going to bother with that sort of thing on my death-bed." Not much can stir up old squabbles, grudges and festering resentments like the reading of a will, and I'm pretty sure Aunt Becky has that in mind w "I am ready to die. I've felt almost everything in life there is to feel - ay, I've drained my cup. But I mean to die decently and in order. I'm going to have one last grand rally. The date will be announced in the paper. But if you want anything to eat you'll have to bring it with you. I'm not going to bother with that sort of thing on my death-bed." Not much can stir up old squabbles, grudges and festering resentments like the reading of a will, and I'm pretty sure Aunt Becky has that in mind when she orders all her relatives to gather before her. First, she insults each and every one by mocking their physical defects or penchants for writing bad poetry. For some, she brings up old missteps and embarrassments. One woman's crime? She once made jam from blueberries gathered in a graveyard. Horrors! Old Becky then proceeds to read off her will, leaving her furniture and other household items to those who want them least. Why is everyone putting up with this crap? They ALL hope to be the one who inherits a rather ugly jug that has been in the family for ages. Who gets it? Well, the answer is in a sealed envelope to be opened and read...in about a year and a half. What follows is a delightful comedy of manners and errors as each family member jostles to be the lucky owner of the jug. Men attempt to stop swearing. Couples come together and split apart. Confirmed bachelors decide that perhaps they should take wives. Secrets are revealed and old mysteries are solved. Montgomery is best known as the creator of the beloved Anne of Green Gables, but she really proves her mettle as a writer with this sly comic masterpiece. The only reason I did not assign five stars is that I was a bit taken aback that the book ends with a racist joke. It was so out of the blue and so out of character for Ms. Montgomery, it was a like a slap in the face. Superb. Absolutely superb. The characters live and step right off the page, leaving me thinking about them after I've closed the book. I like Gay (though she's a weensy bit pathetic and one-track minded) and Roger and Margaret-and even Drowned John, though I wouldn't want to meet him in reality. All the 'damning' does get a little old-it's almost like LMM was trying to show that she could write something 'realistic' and 'grown-up'- but it doesn't interfere with my delight in the story, nor does t Superb. Absolutely superb. The characters live and step right off the page, leaving me thinking about them after I've closed the book. I like Gay (though she's a weensy bit pathetic and one-track minded) and Roger and Margaret-and even Drowned John, though I wouldn't want to meet him in reality. All the 'damning' does get a little old-it's almost like LMM was trying to show that she could write something 'realistic' and 'grown-up'- but it doesn't interfere with my delight in the story, nor does the racism of the Sams (though it's a little disconcerting). It's without doubt one of my favorite LMMs. The thing I like most about A Tangled Web is that when I read it I feel that no matter who I am or what my circumstances are, everything will turn out alright and the dreams I have may come true. There are so many characters in it with their hopes and desires, and I love how she ties up their threads. There's such a broad spectrum of humanity that I think everyone could find herself in at least one of the characters. I guess every LMM book brings me to feel that everything will be okay, giving me lots of hope and optimism, and that is why I'll revisit her work again and again. I started out reading this book on the heels of "Magic for Marigold" and "The Blue Castle" just to simply study the clan dynamics. I do love Marigold's clan a lot and I detest Valancy's clan in "The Blue Castle." I realize that I love Marigold's clan with a child's eyes because that's how we see Marigold's clan-- with a proud child's adoration. I love these Darks and Penhallows with an adults eyes. They are complex and messy and real. I love the stories of the clan in this book and I found myself wishing that I could jump in this book and live among them and be one of them. They all had a love hate relationship with the clan but in the end, they couldn't have survived without each other. They lived in the most beautiful place in the world during a time when life was much slower and they all knew each other and each other's ancestors etc. and stories. Oh and LMM's nature descriptions are so beautiful and healing! For some people in the clan such as Jocelyn and Margaret, this clan knowledge and nosiness proved to to cause them years of loneliness and depression until they decided to just go for what they really wanted no matter what people thought (once they figured that out for themselves). For people like Gay, the clan always protected and supported her and as much as she didn't like it-- they always knew what was best for her. Oh and sweet dear young Brian-- the neglected clan orphan child. I love thee. I can identify with so many stories and people in this book! I spent all day yesterday consumed by it-- a perfect rainy day read that spoke to me on many levels at this moment in my life. Thank you once again, LMM, for giving me your counsel and wisdom right exactly when I needed it. I didn't really have any expectations for this one. For unknown reasons the unread book never appealed to me and it is one of the last Montgomery novels I read. Yet I really liked A Tangled Web. I was intrigued from the very beginning and found myself caring for many of the characters. It was quite an unusual setting for a Montgomery novel to have that many storylines, but for me, it worked well. I enjoyed reading it and I was pleasantly surprised. It all begins with garrulous Aunt Becky and the infamous Dark jug. She may be dying but the old matriarch of the large Dark and Penhallow clan is determined to throw one last "levee" - and stir up her extended family with her plan for bequeathing the heirloom. Dating back to when the first Darks came to Prince Edward Island in the early 19th century, the Dark jug has been in the family ever since, and with it comes a certain prestige for the owner. Over the generations, the Darks and Penhallows It all begins with garrulous Aunt Becky and the infamous Dark jug. She may be dying but the old matriarch of the large Dark and Penhallow clan is determined to throw one last "levee" - and stir up her extended family with her plan for bequeathing the heirloom. Dating back to when the first Darks came to Prince Edward Island in the early 19th century, the Dark jug has been in the family ever since, and with it comes a certain prestige for the owner. Over the generations, the Darks and Penhallows have intermarried time and again, and now they gather in Aunt Becky's rooms to hear what's to become of this jug, and who will get it. But sharp-tongued Aunt Becky's not about to make things easy for them. She announces that the new owner of the jug will be announced a year from October, and that Dandy Dark is trusted with the secret - or perhaps he will make the decision on her behalf, so everyone should be on their toes. And so they all are. Drowned John and Titus Dark stop swearing, knowing that Aunt Becky wouldn't give the jug to someone who curses all the time. Tempest Dark decides to finally start his history of the clan that he's been talking about doing for years. And perpetual bachelor Penny Dark thinks maybe he should get married, if he wants to get the jug, and casts his eye upon the spinsters in the clan. Meanwhile young, pretty Gay Penhallow is caught up in love with Noel Gibson, while her sophisticated and seductive cousin Nan decides to steal him away. Peter Penhallow suddenly and violently falls in love with widowed Donna Dark, whom he has hated since they were children - only he's been travelling through Africa and South America so much he hasn't seen her since, or not until Aunt Becky's infamous final levee. Joscelyn and Hugh Dark, separated on their wedding night for reasons unknown, still yearn for things they cannot have. And forty year old spinster and dressmaker Margaret Penhallow too yearns for things she feels she can never have: a beautiful little baby to adopt and the little old house she calls Whispering Winds. At the centre of it all is the jug, and Aunt Becky's final surprise. According to the inscription on the inside of my copy, I got this book for my birthday in 1993 from my brother (meaning, my mum picked it out for him to give to me), when I turned 14. As far as I can remember I only read it once, but I did love it. I'm always wanted to re-read it, and now I finally have I can say that I still love it. Allowing so much to go by meant that it felt like visiting old friends I hadn't seen in a long time, but with all the surprises still intact: I couldn't remember what had driven Hugh and Joscelyn apart, I couldn't remember how Donna and Peter finally overcame her father, Drowned John's, refusal to let them marry; and I couldn't quite remember what happened to Gay Penhallow - though I was pretty sure she did end up with thirty-year-old Roger, the clan doctor (rest assured, it's not as Jane Austen as it sounds - Gay is no Mariane Dashwood). There are of course A LOT of characters to keep track of, and at first they tend to blend one into another (for instance, there are two Penny Darks: one is the bachelor and the other is Joscelyn's sister-in-law), and it doesn't help that they go by the old naming conventions (e.g. "Mrs Frank Dark"); you'd think it would but it doesn't. But Montgomery focuses on the main characters, and since the novel takes place over about a year and a half, we get to know characters, progress somewhat with their story, then come back to them later, so you do get very familiar with them - and like I said, they start to feel like your own crazy extended family! Montgomery is so good at writing these character sketches (one has only to read those scenes set around the dinner table at family gatherings in The Blue Castle to get a sense for it), that for all their eccentricities you have to wonder just how many of them were based on real people Montgomery knew. The pacing is wonderful: brisk and rolling like gentle hills, here getting dramatic, then slowing down again for a spell, a breather, before dashing off into a new plot. Perhaps the most tragic character for me was little Brian Dark, whose mother, Laura, died when he was young, never revealing who the father was, so that Brian lives with his uncle Duncan Dark and his family, barely fed or clothed and given endless chores, mostly to look after the dairy cows. It broke my heart a little bit, especially now that I have my own little boy. Over the years, 60 Penhallows have married 60 Darks. These two families have formed a clan and its members are expected to marry into each other's families. The clan is full of characters, yet one in particular stands out; Aunt Becky. At 96, Aunt Becky isn't long for this world. Yet her tongue continues to spit fire and she forgets nothing even on her death bead. Most dread an encounter with Aunt Becky fearing that she will drudge up some sordid detail of their past, yet there is one thing that Over the years, 60 Penhallows have married 60 Darks. These two families have formed a clan and its members are expected to marry into each other's families. The clan is full of characters, yet one in particular stands out; Aunt Becky. At 96, Aunt Becky isn't long for this world. Yet her tongue continues to spit fire and she forgets nothing even on her death bead. Most dread an encounter with Aunt Becky fearing that she will drudge up some sordid detail of their past, yet there is one thing that brings almost all living members of the clan to her levee; the jug. This jug has a romantic history behind it and Aunt Becky has been in its possession for years. All members of the clan crave a chance to own the infamous jug and hope that when Aunt Becky dies it will be left to them. Yet as a seemingly last jab at the entire clan, Aunt Becky has decided that Dandy Dark, the least expected member of the clan, will be the keeper of the name of the jug's recipient with instructions to reveal the name after one year. Aunt Becky spouts off a laundry list of things that would keep a person from receiving the jug, yet also admits that these things may not affect her decision. Over the course of the year, many things take place. Gay Penhallow, much against the clan's wishes, falls madly in love with and becomes engaged to an outsider, Donna Dark surprises everyone by falling in love with Peter Penhallow and vice versa. And the age old question of why Jocelyn Dark left Hugh on their wedding night still hangs in the air. This is the first adult novel I've read from L.M. Montgomery. I rented a copy from my local library and am surprised to find the edition I read labeled YA. This book certainly isn't YA. Though not terribly vulgar, it does have a few curse words and hints at some mature subjects. It's different to read after having read her young adult novels, but this is a really good book. I just recommend keeping it away from younger readers. I'm kind of on the fence as to whether or not to label this book a romance. There is plenty of romance in lot of the stories, yet some are not romantic and I feel like that isn't the main focus of the book. The main focus seems to be how this jug affects the lives of the clan over the course of a year. I could be wrong, though. This book has so much going on, yet ties in well together. Each chapter deals with a different story of one or more of the clan's members. My favorite characters were Gay, Donna, Peter, Jocelyn and Hugh. Even though I wanted to roll my eyes at Gay some of the time, I still found myself curious as to what would happen in her part of the story. Donna and Peter's story was probably the most romantic and I love the tragic romance of Jocelyn and Hugh's story. I was curious as to how all of these stories would unfold and was happy with all of their endings. Aunt Becky is quite a character. She's so hateful and says such mean things, but one does come to feel sorry for her just before her end. And Nan Penhallow is like that evil soap opera character that you can't help but watch. She's so spiteful to sensitive Gay simply because she thinks it's fun. I was pretty glad that she wasn't in the book more than she was. I think the title "A Tangled Web" is perfect for this novel. So many of the stories within the book are tangled and even the clan itself is tangled with 60 Penhallows having married 60 Darks. Could this quaint book of family feuds and reconciliations been given any other name? I guess not. A better title than 'a tangled web' cannot given for such a narrative of intricate, invisible and strange ties that binds and breaks families (read clan). Like many others, it was the magic of the Blue Castle which brought me into this Tangled web, to say that it was nothing like the beloved Blue Castle was a little disappointing in the beginning but the beauty of the PE Island and the sweetness in Could this quaint book of family feuds and reconciliations been given any other name? I guess not. A better title than 'a tangled web' cannot given for such a narrative of intricate, invisible and strange ties that binds and breaks families (read clan). Like many others, it was the magic of the Blue Castle which brought me into this Tangled web, to say that it was nothing like the beloved Blue Castle was a little disappointing in the beginning but the beauty of the PE Island and the sweetness in the writing of Ms. Montgomery were undeniable. I had recently read the wiki page of this talented author and was amazed & saddened by her miserable personal life. Though out this book, it was the unhappy but understanding voice of Ms. Montgomery which was reflected in each of the characters... especially the hilarious, impolite, sharp and rather intelligent Aunt Becky. Even the dedication of this Book (to a Mr and Mrs. Fred W.Wright - in memory of a certain week of laughter) made me think how much bereft of laughter Ms. Montogomery's life must have been when the book was first published in 1931. Coming back to the story line, the book starts with Aunt Becky preparing for her impending death by distributing her priced possessions to Clan with the exception of a historic Jug which is entrusted to be given out one year after her death and the book ends with the distribution of the Jug. A splendid book of multitude of characters with smatterings of romances & scandals here and there. This book is an absolute character soup with numerous banal subplots centered about the completely asinine question of who gets an old, ugly heirloom jug. Yet, it is brilliant. In appreciating art, I have always had a soft spot for those works that take things to such extremes that I am forced to love what I would normally hate. 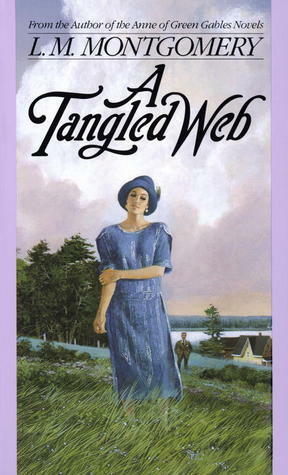 In A Tangled Web, L. M. Montgomery succeeds in layering so many different characters that they become part of the setting, and unlike in the similar character stews (lik This book is an absolute character soup with numerous banal subplots centered about the completely asinine question of who gets an old, ugly heirloom jug. Yet, it is brilliant. In appreciating art, I have always had a soft spot for those works that take things to such extremes that I am forced to love what I would normally hate. In A Tangled Web, L. M. Montgomery succeeds in layering so many different characters that they become part of the setting, and unlike in the similar character stews (like, say, in the works of Jane Austen) you are not only not expected to keep track of them all, but to do so would ruin the effect Montgomery wishes to achieve. The same is true with the jug; to question why the various Darks and Penhallows so covet it is to miss the point. In short, A Tangled Web is well worth a read; the prose is exemplary and injected with just the proper amount of levity, so even after the book concludes with the telegraphed anticlimax, you are more than happy at having read it. I finally finished this! Woohoo! When I started this, I was so excited. And then let down. This book wasn't at all what I expected. The first half of the book was really hard to get through. The second half picked up and I was enjoying it when I was reading it, just not as much as I would've liked. There were so many characters to keep track of, but I did it! I think I remembered who everyone was and which stories belonged to which characters. My favorite stories were G I finally finished this! Woohoo! My favorite stories were Gay's and Roger's and Hugh's and Jocelyn's. I must admit, the next to last chapter was absolutely hilarious! I couldn't help laughing! I added a half-star just for this chapter! I didn't care for the language, which there wasn't a LOT of, but it just didn't fit in with a Montgomery story, in my opinion. Also, that very last line...not my ideal ending to a book. I really didn't like it. Overall, I'm giving this book 4.5 stars out of 5. I wasn't sure I would enjoy this, but once I'd made it through the first couple of chapters it became hugely entertaining. I never did get a grip on who all the cousins were or how everybody was related but it didn't matter - just enjoy the ride. Because the ride is the thing with LMM. It's fairly obvious from the start what the endings of all the subplots will be but it's far from clear how we are going to get there, and her ingenuity often is quite brilliant. So I think this is one I may come b I wasn't sure I would enjoy this, but once I'd made it through the first couple of chapters it became hugely entertaining. I never did get a grip on who all the cousins were or how everybody was related but it didn't matter - just enjoy the ride. Because the ride is the thing with LMM. It's fairly obvious from the start what the endings of all the subplots will be but it's far from clear how we are going to get there, and her ingenuity often is quite brilliant. A strange little book. Enjoyable in that it was a rather nice piece of gossip. Very Montgomery with the ideal of the "Clan" family. United against anyone from the "outside" yet snapping and biting each other all the time in private. A book set in its time, place & people. A polite wasp story. Ending is typical for its time but still unnecessarily offensive. I'm not sure what Montgomery was trying to achieve, except she was trying to demonstrate how uncouth the Sams were or she was showing of A strange little book. Enjoyable in that it was a rather nice piece of gossip. Very Montgomery with the ideal of the "Clan" family. United against anyone from the "outside" yet snapping and biting each other all the time in private. A book set in its time, place & people. A polite wasp story. Ending is typical for its time but still unnecessarily offensive. I'm not sure what Montgomery was trying to achieve, except she was trying to demonstrate how uncouth the Sams were or she was showing off by being lady author using 'common' language. Either way the chapter could have been edited out and none of the rest of the story suffer for it. I'm sorry L.M. Montgomery fans, I just can't read this book right now. I am finding it painful to continue, I only like three people out of the dozens of Penhollows and Darks. In the summer, when I have more patience I may try again. Maybe then I will be able to stomach A Tangled Web. Right now, I just can't be bothered. Why everyone wants an ugly old vase that has no sentimental value I don't know. They're all ready to bite each others heads off for the stupid thing! And that infuriating Nan! Ug I'm sorry L.M. Montgomery fans, I just can't read this book right now. I am finding it painful to continue, I only like three people out of the dozens of Penhollows and Darks. In the summer, when I have more patience I may try again. Maybe then I will be able to stomach A Tangled Web. Right now, I just can't be bothered. Why everyone wants an ugly old vase that has no sentimental value I don't know. They're all ready to bite each others heads off for the stupid thing! And that infuriating Nan! Ugh. I. Can't. Take. Her. I forgot about the abundant swearing for a LMM book and racist ending but the humor is still brilliant. L.M. Montgomery usual milieu was the young-girl-grows-up-story, but she occasionally crafted a story aimed toward the more adult end of the spectrum. The Blue Castle, for one, which is a wonderful story. A Tangled Web is another. First published in 1931, it follows a large cast of characters, all belonging the extended Dark and Penhallow clans as they speculate on who will inherit the "old Dark jug" from dying Aunt Emily. We particularly pursue half dozen or so of the family members, all of whom L.M. Montgomery usual milieu was the young-girl-grows-up-story, but she occasionally crafted a story aimed toward the more adult end of the spectrum. The Blue Castle, for one, which is a wonderful story. We particularly pursue half dozen or so of the family members, all of whom seek and find love or companionship in a variety of amusing ways. We have young lovers, estranged lovers, confirmed bachelors, lonely old maids, lonely children - the usual cast. It's a different kind of book for Lucy Maud, one that regularly flits between people and perspectives, following various threads over the course of several months or so. As is usual for Montgomery, the tone is usually sentimental and comic, and is usually successful in eliciting smiles and laughs. I had believed that I had already read all of Montgomery's novels, so it was an agreeable surprise to find one I hadn't. While no classic, I had a good time reading it. This was one of the most entertaining books of this genre I have ever read. Montgomery has such a knack for portraying silly, interesting, still very convincing and lifelike characters. And the clan and family dynamics seem true and familiar as ever, showing that people are the same no matter where, and have the same life dreams, hopes, disappointments and wonders in their life. One of my favorite books by Montgomery, Anne and Emily series included. Such a joy to read. “Really, Nan could be very odious when she liked. Yet somehow she [Gay] didn't hate her as before. She felt very indifferent to her. She found herself looking at her with cool, appraising eyes, seeing her as she had never seen her before. An empty, selfish little creature, who had always to be amused like a child. ...A girl who posed as a sophisticate before her country cousins but who was really more provincial than they were, knowing nothing of real life or real love or real emotion of any kind. Gay wondered, as she looked, how she could ever have hated this girl—ever been jealous of her. She was not worth hating. Gay spoke at last. She stood up and looked levelly at Nan. There was contempt in her quiet voice.